This is where all the processes and process controls throughout the system come to play and deliver the nitrogen to your plant system ready for growth. How this area performs will depend greatly on how your system is set up and if you have separate process areas or all combined. A key point to note is Nitrogen chemically unreactive but stable where as Nitrite is very unstable. Nitrogen is not easy to store in a biological environment, it will either be used or degraded to Nitrogen gas. For example, we previously mentioned Rakocy 60 grams of feed per m2. This is in a deep water culture system with solids separation, a small amount of treatment before delivering to the rafts. With the backwash of solids into a retention pond outside of the system, there is significant loss of nitrogen. I will estimate approximately 50% of nitrogen is lost to the environment. Alternatively Lennard shows 16 grams of feed per m2 with the same protein level and plant density and cultivar. It is not clear what Lennard uses for process control of the nitrogen. However there is clear indication a “mineralization tank” (A simple aerated tank) is used to “dissolve” solids from the fish system before delivering nitrogen to the plant system in doses by skimming off nutrient rich water from the “mineralization tank”. While we are comparing nor questioning the results above, they stand as an example of how simple process control changes will dramatically effect the end result in terms of nutrient efficiency. Both systems have shown results of growth similar to each other, however the amount of feed input to gain the same result is vastly different indicating there is a great deal of value in understanding the processes within any given system to identify opportunities to increase efficiency. If you have independent process control it will be more efficient than if you are using just a grow bed filled with gravel to do everything in one place. This is not to say media beds do not work, the evidence suggests they do. However the capacity for nitrogen losses through gas is very high in media beds, so you may not get the best bang for buck out of your feed input costs but it will work. One of the primary areas of nitrogen loss is through the denitrification process. This generally happens when you have little to no oxygen in the particular process and plenty of nitrogen floating about. What happens is the nitrogen compound (eg Nitrate NO3) donates its oxygen to the microbial process. Each step of the way through denitrification in an Anoxic environment (low to no oxygen, high nitrogen) looks a little like this: nitrate (NO3−), to nitrite (NO2−), to nitric oxide (NO), to nitrous oxide (N2O) finally resulting in the production of dinitrogen (N2) which is gassed off to the atmosphere. Gone until lightning strikes it… The areas with denitrification are best minimalized to help prevent the loss of your precious nutrient and your money. All areas within your filtration are prone to denitrification and in general all systems have losses no matter how good the design is be it directly in the filtration or on the inside surface of distribution pipes. However, systems that carry high organic loads (poor solids filtration and management) or media beds filled with organics will always have much higher denitrification than other environments which encourage aerobic, well oxygenated processes. It is important to allow for this in your calculations. We will discuss each step in further detail below. Temperature changes have a large impact on the performance of any system and is difficult to account for all of those variables in this simple calculator. This is to say we are assuming you have a stable system in a stable, consistent environment. Let’s get on with it…. Assimilated This is a topic, we could write a book about… The amount your fish will assimilate is how much digestible energy they retain for their energy needs and somatic growth assuming they consume all of the feed. The balance of the nitrogen is not assimilated and directly excreted in feces (“Solids Fish”). That is the short story. In other words the anabolism, constructive metabolism (energy assimilation) for growth plays an important part of this equation and is directly affected by the feed quality, feeding level, temperature and dissolved oxygen. This is an extremely difficult number to assess because of the variations in culture conditions and the vast inconsistencies and variations feed supply and quality. Anabolism, as we mentioned earlier is responsible for fish growth, however catabolism or destructive metabolism is where energy is burned or lost from the fish in excretion of chemical compounds (and heat), primarily dissolved ammonia and small amounts of urea. This is considered a loss or consumption of energy, not a gain (eg weight). The tricky part is distinguishing what level of each process is happening. There is decades of research on this topic with no agreed conclusion for bio-energenic modeling…. yet. In other words, no one model fits all. The same ambiguity applies to this model. 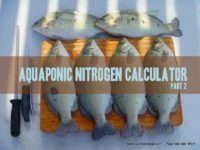 The above equation is one of the more successful models (specifically for pond grown Tilapia) however it is extremely complex and outside of the scope of this calculator. So we are going to keep it relatively simple to give us an acceptable result in both growth of the fish and the plants. Most species with high quality feed and good feed management you may get up to 80% assimilation rate. However in smaller systems (eg at home), the assimilation can be reduced to as low as 65% and the balance will be uneaten feed and fish poop (“Solids Fish”). Set point assimilation 65% worst and 80% best. The balance will automatically be added to the “Solids Fish” which is the essentially the poop. 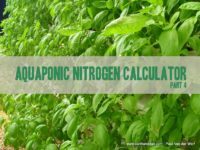 The difference between the two will be the immediate availability of nitrogen for plant growth following bio filtration, without additional processes. For example if your assimilation rate is low, then you will generate more solids requiring more energy to process them for plant available nutrient nitrogen species eg Nitrate. Dissolved Fish The dissolved wastes are in the form of nitrogen excretion (eg Ammonia NH4 + NH3) during catabolism. This varies dramatically from species to species along with condition, age, feed suitability and digestible energy. This is the direct nitrogen available to your bio filtration process in the aquaculture loop of your system and can be used for the size determination of the bio filter. There is a substantial amount of text available that indicates a wide range of dissolved excretion rates for various commercially cultured species. However it is often best to use literature dedicated to the species of fish you are growing. If you cannot locate details specific to your fish, a set point of 75% will get you started. Set point dissolved can be between 60% and 90%. Sidebar about Ammonia: If your system is cleverly designed to deliver ammonia directly from the fish system as needed, it allows you to control the pH of the plant system without use of buffers or acid. This is one of the “tricks” we use in our integrated systems and something you won’t hear anyone talking about…. Not an easy thing to do but it works very well. The reason for this is ammonium ion has a positive charge and when plants take it up they release an equal portion of positively charged ions. In our case hydrogen (H+) is released. The increase in hydrogen lowers the pH of the plant system. When the plant system takes up Nitrate, which is a negatively charged ion, the plant roots will release an equal portion of negatively charged ions to maintain a balanced pH in the roots. In this case hydroxide ions (OH-) are released which will increase the pH. So if you are dosing only nitrate to your plant system it will naturally increase in pH, if you are dosing primarily ammonium in your plant system (directly from the fish without biofiltration), your pH will drop. When you design your system to equally balance the two out, you will find the pH will remain at a constant state without any need for ph buffers or acids to control it because the combination of H+OH creates water H2O…. Something to consider. Solids The solid wastes are made up of both the uneaten feed which I hope you have none of and fish poo entering the system from your fish feed. These solid wastes are moved through the system to be processed later for the plant system. This is a very soft number affected by a wide range of influences, majority related to the feed type and feeding practices. This is excreted as organic nitrogen. And is the balance of the total feed minus the assimilation. EG Assimilation 70% then solids will automatically be 30%. If you are feeding your fish a protein content that is too high you will find they do not retain as much for growth and this solids number will be quite high. Can be as high as 40%. Growth This refers to the amount of Assimilated goodness the fish retains for growth (constructive metabolism). This is the balance of what is excreted as dissolved wastes. Literature tells us this can be as high as 25% and as low as 15% and species dependent. The lower the percentage, the higher amount of dissolved wastes move through for processing in the plants side of the system loops. As it gets higher the more fish growth you will have and obviously the less goodness is left available for further processing in the plant loop. This is Nitrogen removed from the system total at the end of the process but it is not a loss because you will be removing the nitrogen in the fish when you harvest. Cell Loss Fish The “Cell Loss Fish” refers to the nitrogen the microflora in the fish system use for their own growth. This is primarily in the bio filtration stage but happens throughout all the surfaces in contact with the water within the fish system and plant sub-system. In general terms it has been noted 2% to 3% of the nitrogen input is used by the microbes’ growth throughout the fish system. However, depending on how your systems are set up, this can be set to 0% because any nitrogen stored within the bacterial cells will be reclaimed as they die off. This is especially true is you are reclaiming all the solids in the system. Set Point Cell Loss Fish can be 0%. To account for water exchange 2% to 3%. Cell Loss Plants The Cell Loss Plants” refers to the plant system loop losses to microbe cell growth. As there is a great deal more bacterial activity in the plant system with much more diversity, the cell growth nitrogen use can be as high as 8%. In general aerobic digestion allowing for 6% to 7% provide acceptable results. Same as the cell loss in the fish system, the nitrogen assimilated by the microflora in the plant system is not lost. However, depending on your system design, such as a media bed, you may want to allow for it as a loss because much of the cell mass will be in anaerobic zones in the grow bed and will be denitrified as the nitrogen is released on death of the little fellas. Set point Cell Loss Plants can be 0%. With water exchange etc 6% to 7% (6.5%) will work however most plant systems will reclaim that loss as the bacteria die off and are again broken down by more bacteria. It is a constant cycle in any biological system. Denitrify Fish This field refers to the denitrification in the fish system. Denitrification will happen no matter how good your design is. That is just the nature of the beast. In fish systems it can be difficult to quantify because of all the wonderful microbial activity going on. So the nitrogen could be anywhere really. At a base it is good to allow at least 10% denitrification in the fish system and at least twice that in poorly filtered (solids) systems. If you think you can lower it, you can but the expectation is that 10% will be the minimum. Set point Denitrify Fish minimum 10% and up to 30% (especially for long pipe lines). Denitrify Plants This like the fish denitrification refers to the denitrification in the plant system. This is a very loose and often very high number. Some aerobic digestion will still lose up to 50% of the nitrogen to gas. This is where the savings can be made in the design of the mineralization process of the solids in the system. As with the fish system, it will be best to maintain at least 10% loss of nitrogen. However it will be worthwhile to adjust this field as high as you think acceptable. I would indicate at least 45% losses which is only from the solids portion of the nitrogen but it does make significant difference to the end result. Set point Denitrify Plants minimum 10% up to 50% (especially for media beds and systems with only partial nitrogen processing) Nitrogen Balance This is a calculated field which indicates the percentage remaining of the total nitrogen put into the system and shows the total kilograms of nitrogen available for plant growth. The chart above is to give you an indication of how the processing of the solids (fish wastes and bacterial floc) affect the overall nitrogen availability for the plant system. The calculator will have only one input percentage cell for use so you can set your expected processing of solids to your particular system. Keep in mind it is difficult to quantify every possible system configuration. For example if you have a system at home with just media beds, you may want to set this cell to 100% to suggest you will be processing all of the solids in your grow bed. However, in doing so you may also want to increase your denitrification in your plant system to somewhere around 60% due to the tendency towards more denitrification than processing solids aerobically. The result would look a like this: This shows using a media bed to do all of your solids processing inline may result in only utilizing around 40% of the solids, even though you are setting it to process 100%. The increase in denitrfication reduces the overall efficiency of the nitrogen use due to the losses to atmosphere. It is interesting to see all the processes and how each one affects the overall performance of the system. The more nitrogen you can have left over after all of that, the more productive the system will be overall. This is a very complex part of the modeling and the next part is even more so but very interesting to see what the results of this will be in terms of plant production. We will assess the fish to plant ratio in the next part using 5 different varieties of plants….